What piece or pieces have made you go WOW on first hearing, if any? Thread: What piece or pieces have made you go WOW on first hearing, if any? Mozart Symphony No. 41, particularly movement 4; I don't think I've ever been more instantly floored by any piece of music. Hekla is so cool! I just heard it a couple weeks ago when someone nominated it for the angry music game, and I loved it. About 2 months ago I watched the Hekla volcano on location in Iceland while listening to this piece. Sadly, no eruption, but still, wow! Last edited by DeepR; Nov-07-2018 at 23:27. ^ Yes, that's right. It should continue to make you think "wow" ... it isn't just the first time or whenever you first get it. The most tremendous genius raised Mozart above all masters, in all centuries and in all the arts. Mozart is the greatest composer of all. Beethoven created his music, but the music of Mozart is of such purity and beauty that one feels he merely found it — that it has always existed as part of the inner beauty of the universe waiting to be revealed. The first time that I heard Martha Argerich play Prokofiev's third piano concerto, it just blew me away. I have heard others play this piece very well. But none of the other renditions hits me like Argerich's performance. For me it was the first time I heard Symphonie Concertante by Joseph Jongen. Another wow is the Concerto for Organ, Strings and Timpani in G minor by Francis Poulanc. Of course any of the organ works of Messiaen. The earliest "wow" I can remember is Rimsky-Korsakov's Russian Easter Overture. I heard it on a cassette tape at my grandparents' house when I was 8. I was blown away. Had never heard anything like it. And yes, I still love all of these works. Last edited by Tristan; Nov-08-2018 at 19:01. Dufay's Lamentatio sanctae matris ecclesiae Constantinopolitanae: Even earlier music! Byrd's Pavan & Galliard, as played by Glenn Gould: for Renaissance keyboard music. Schumann's Gesange der Frühe, a pretty unique masterpiece. Last edited by silentio; Nov-08-2018 at 23:05. 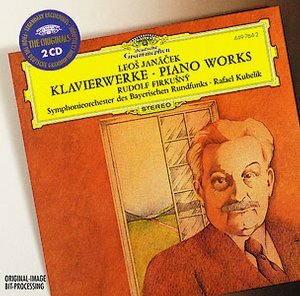 Not my first listen, but Rudolf Firkusny playing Janacek's On The Overgrown Path had me humming along in a Gouldian like rhapsodic state. If you haven't listened to this classic DG recording, do yourself a favor and find the time. Firkusny (who studied with the composer from age five) and Janacek are a match made in heaven. Sublime music making. All times are GMT +1. The current date and time is Apr-24-2019 23:49.